Or so I hope. I haven’t heard from Maria Chappelle-Nadal’s lawyer since Monday, and I haven’t been served with any papers this week. Prior to the primary, I received several more e-mails imploring me to retract my statements before it was too late, but I’ve received nothing since. I’m assuming that Chappelle-Nadal, having now won the state senate seat, has wisely decided to back away from pressing her lawsuit against me. It’s probably a really good decision, considering that she already won her race, she wouldn’t win the lawsuit (truth is an absolute defense), and she would only draw further attention to her lie. In fact, I wondered why she would even bother to lie or threaten a lawsuit in the first place, given that she was very confident in her victory at the polls, and the target of her lie trailed her badly in her estimation at the time and in the final tally. In any event, we won’t shrink from calling people liars, even if they have good progressive voting records. A lie is a lie, no matter who tells it. I fear that Maria Chappelle-Nadal may learned that lying won’t cost her a victory, but I hope that in the future she will know not to threaten people who disagree with her or call her out on her behavior. And it is my earnest hope that Maria Chappelle-Nadal grows up a little in the Senate and manages to accomplish something for the residents of her district. So here’s Maria Chappelle-Nadal’s defense for attacking Joe Adams as “bought” by Rex Sinquefield. She has a release from the American Federation of Teachers claiming that Rex Sinquefield donated money to one committee that in turn donated to another committee that ended up buying an ad touting the AFT local’s endorsement of Joe Adams for University City mayor in 2006. Got that? The ad cost $396, and several other contributors gave money to the 80th Legislative District Committee, including The Pasta House, which is owned by Adams supporter Kim Tucci. In other words, this is a minor ad removed three times from Rex Sinquefield which was easily covered by contributors who had nothing to do with Sinquefield, and still not even paid directly to Adams’ campaign. 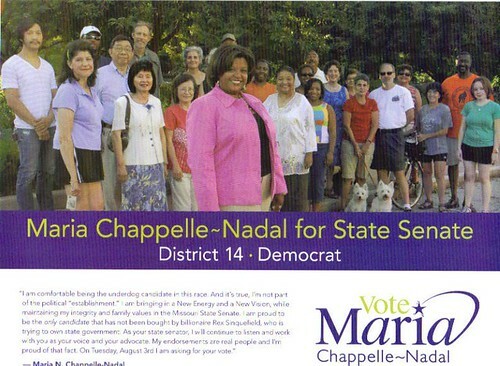 It’s telling that the Chappelle-Nadal campaign comes up with this lame attack right before the election. If they had real evidence, they would have released it months ago and hammered Adams with it. Instead they release a last second blast hoping to tar an opponent unfairly without enough time to correct the record for voters. 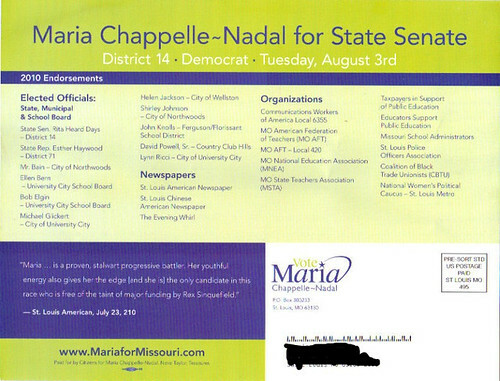 And this doesn’t even cover the fact that Maria Chappelle-Nadal blatantly altered the text of the St. Louis American endorsement to misrepresent what the newspaper wrote about Adams and Chappelle-Nadal. What you have to know is that AFT is now lying to try and back up the original lie. They claim the 80th District Committee was primarily funded by All Children Matter PAC which is a school voucher PAC that is heavily funded by Sinquefield. It is true that All Children Matter sent $5,000 to the Committee before the ad (a $400 cost). Adams also received a $3,200 donation from the 80th Committee on April 1st. However the bulk of funding for the 80th for the first three reporting periods of the year is Pyramid Construction that donated $20,000. Of course, Maria might want to give her good friend Jamiliah Nasheed a call as well since she received a donation from the 80th that year as well. The full text of the AFT release is below the fold, complete with typos. ST. LOUIS (August 2, 2010) – American Federation of Teachers (AFT Missouri, AFL-CIO) recently learned that Joe Adams, Democrat for State Senate in the 14th District has denied any funding from billionaire financier Rex Sinquefield, but campaign finance records for the 80th Legislative District Committee show otherwise. intentional lies designed to tarnish her reputation. Can you specifically cite which claims that I have made that you believe to be false, and can you please provide evidence to substantiate those claims? As I’ve previously stated, I would gladly retract any statements which are proven to be false, but I will not retract a statement without compelling evidence that it is false. UPDATE: ArchPundit gets involved on Blog Saint Louis. […]So Maria and her lawyer, please add me to the any lawsuit. If you notice the about page, my address is there if you wish to serve me. Eric is right here-Maria is blatantly lying by modifying a quote from the St. Louis American. There’s simply no question there. If she wants a retraction, she needs to provide the evidence that Sinquefeld did pay for a pro-Adams flyer.So far, she has refused to do any such thing. If she can provide the evidence, she also can request the American make a correction, but that does not absolve her of passing along a fake quote regardless. Of course, no evidence of such a flyer exists and it should be available in the Missouri campaign finance reports. Oh, one thing Maria-I will seek to recover all legal costs from you and your attorney and seek full penalties for spurious litigation if you do try it. Cheers! UPDATE 2: Blue Girl offers her support on They Gave Us A Republic in a way that only Blue Girl can.